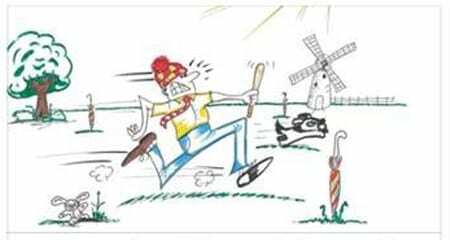 Another New Year, another game of Rounders on Wimbledon Common and we’re delighted to report that the Wimbledon Windmillers are still going strong, 46 years on. Every year, since 1st January 1974, when the day became a national bank holiday, a group have gathered together to see in the New year with a game of Rounders on Wimbledon Common. A collection of colleagues, friends and family members have created a tradition that has amazingly survived through the decades. It is fair to say that despite the passage of time, a sprightlier bunch of pensioners would be hard to find. This year, the group of Rounders enthusiasts were fortunate with the weather. In the past they have experienced rain, hail, snow and sunshine. In 2015 the group were treated to lovely sunny conditions however 2017 saw steady rain from mid day. Twelve hardy regulars braved the conditions for a quick catch up this year. The games were confined to 4 innings which lasted between 15 / 20 minutes each. The final score over the duration was 12 Rounders v 11 Rounders. The batting on display was significantly better than the fielding, age considered. As always, everyone then adjourned for the co.operative tea party which was a success. Warming up in a kind soul’s house makes all the effort worthwhile. Support and enthusiasm for this annual event has not diminished and a 50th anniversary in 2023 looks quite possible. Attendance is by invitation only but spectators are always welcome. We could do with extra numbers in the deep square leg area where the ground slopes down and big hits almost automatically gain a rounder. I think we may put the pitch through a 180 degree turn next year! Rounders England is a non-profit sport’s governing body (NGB) in England. Based in Sheffield it provides a structure for the sport from the Board, local deliverers and teams right the way through to individual members and volunteers.